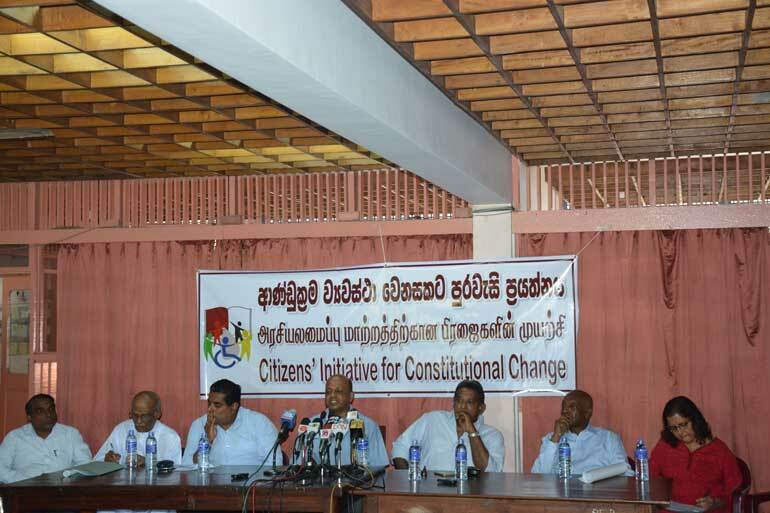 A CSO collective called the Citizens’ Initiative for Constitutional Change (CICC) organised a press conference on 12 January in Colombo, to give publicity to the process of collecting citizen input to feed into the government’s current constitution-making exercise. Speakers at the press conference included Attorney at Law and Chairman of the Public Representation Commission, Lal Wijenayake, Centre for Policy Alternatives (CPA) Executive Director Dr. Paikiasothy Saravanamuttu, PAFFREL Executive Director Rohana Hettiarachchi, Human Rights Activist S.G.Punchihewa, Women and Media Collective Coordinator, Kumudini Samuel, Rights Now Executive Director Attorney-at-law Sudarshana Gunawardana, as well as the Transparency International Senior Manager, Shan Wijetunge. CPA Senior Researcher, in charge of its Outreach Programs, Lionel Guruge chaired the briefing. Guruge urged the media to give maximum coverage to the process of facilitating citizen participation in constitutional reform and said it was most important that all citizens of the country, Sinhala, Tamil Muslim, young and old, and all minorities are be able to think of it as “Our Constitution.” It was important for detractors and diverse opinions to be given a voice, too, but the process should not be disturbed by them. CPA Executive Director Dr. Saravanamuttu said that CPA and similar organisations of the CICC had been committed to constitutional reform for over a decade, and it was now a historic and decisive moment to ensure that the country gets the constitution it deserves. Since the political developments of 2015 it remains to bridge the democratic deficit by addressing the areas that require reform, particularly abolishing the executive presidency and devolving executive power among the Cabinet and Parliament, bringing about a new electoral system, and constitutional settlement of the national question which remains at the heart of this country, as a functioning democracy, which accommodates and answers to the grievances and aspirations of all of its people. Media has at times been good at causing controversy, retorting or stirring dissent, but now it has a chance to play a vital and positive role and make a real difference in the future of the country, according to human rights activist, author and Attorney-at-Law S.G. Punchihewa who spoke about specific provisions in the Constitution that had been identified as requiring strengthening. These included the sections on human rights, the five paragraphs on fundamental rights and different aspects of the 13th Amendment. Punchihewa discussed the requirement to include “Right to life,” in the Constitution. Broader interpretation is required, as in India where this covers air, food, water and environment with recourse. It is important also to strengthen the Human Rights Commission by reinforcing its powers, he stressed. Language equality was another matter which needed to be unconditionally emphasised. Wijetunge outlined four main categories of provisions that were under discussion, including the reform of the Executive Presidency, fundamental rights, power sharing, and electoral system reform, and said that they were ready to present recommendations to the government including such suggestions as: abolishing the Executive presidency, limiting the cabinet to 25 members, scientific categorisation of ministerial portfolios, having a fixed election calendar, holding LG and PC elections together to save on expenditure, setting a ceiling to the election expenditure on election campaigns. PAFFREL ED Rohan Hettiarachchi spoke on the much debated subject of electoral reforms, including women’s representation and stressed that a simple election system is needed which does not squander the country’s assets – approximately Rs. 4,000 million of public funds were spent on each election(by the Elections Department alone). Furthermore there should be a system of ensuring that all can vote, e.g. doctors, or prisoners, as was the case in Afghanistan where ‘mobile voting’ is available, although it cannot be said that their democracy was more advanced than in Sri Lanka. He recognised that there was a very small time period to get a lot of work done and said “we must all try our best”. Women and Media Collective Coordinator Kumudini Samuel spoke about the need to strengthen women’s rights through the constitution, and a more effective legal system, with a broader focus being placed on socio economic rights, the right to livelihood, right to housing, food, and health. She also advocated for an Independent Women’s Commission and enforcing political rights for women. 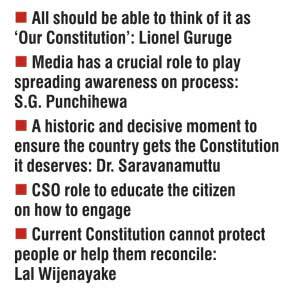 Attorney-at-Law and Chairman of the Public Representation Commission Lal Wijenayake said that CPA and a number of other CSOs have been requesting that the constitution making process is not limited to Parliament but should be with maximum public participation. “There are mechanisms in place but is there enough time? The people are eager and enthusiastic to engage,” he said, adding that a newspaper advertisement in three languages had been issued on 12 January to invite the participation of the people, to a large scale program from 18 -22 in Colombo at Visumpaya at 9:30 a.m., which was for the purpose of gathering public input. In the rest of the country, the District Secretariats are organising such venues, and are to give notice at least a week prior to the events, although media has a very important role to play in increasing awareness on the exercise. He said that the questions people asked were “why do we need a (new) constitution?” and “Isn’t the existing one enough?” and he pointed out that in the last few years, people had been on their knees, and Government Servants had been tied to trees, as the existing Constitution was not able to protect them, and even six or seven years after a protracted war, it had not been able to help the people of Sri Lanka reconcile. “My duty now is to listen, rather than speak,” he said in closing. Rights Now Executive Director Sudarshana Gunewardana said that nation building usually starts after independence but the process of bringing people together as one nation has not been a success in Sri Lanka as evident from both the insurrection in the south by rural youth and the 30 year war in the north which were caused by people not feeling as though they were part of this nation. Finally it was now an opportunity to collect everyone’s views and make a completely new “agreement” that respected the needs of everyone. A media representative questioned as to how the challenge of language barriers would be overcome in this process and CPA Senior researcher Lionel Guruge assured that every measure would be taken to ensure that required translations would be provided in the field work of the Citizens Initiative, which was making arrangements to provide simplified translated primers. Further media questions were answered and a CPA publication titled “Why do We Need a Constitution?” was distributed to attendees. This press conference was the latest in a series of events held by CPA bringing awareness to the process of garnering citizen engagement in the current Constitution drafting process. By pooling in the resources of all organisations involved in the CICC, the Initiative aims to conduct broad scale workshops across the country to raise awareness on the governments’ proceedings with regard to the Constitution process, as well as encourage and identify recommendations of the public for the new Constitution. As the Government declared the establishment of a Public Representation Commission entrusted with the task of compiling public submissions, the CICC at its various workshops will encourage citizens to contribute to this Commission. Parallel to this Initiative, a youth campaign titled ‘My Constitution; A Youth Movement for a New Sri Lankan Constitution’ has also been launched and aims to encourage youth populations to contribute to the new Constitution process. More information about the citizen initiative is available from ciccinitiative@gmail.com or lionel@cpalanka.org.